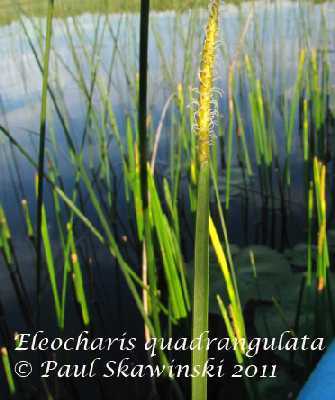 Eleocharis quadrangulata is a perennial C3 spikerush (Pascal-Antoine 2008), tufted, colonial from rhizomes, stems stout to 1 m tall, 0.2-0.6 cm wide, sharply 4-sided. Flower spikelet cylindrical, 2-5 cm long about as wide as the stem, scales in 4 rows to 0.6 cm long, tip rounded, margins paper. Fruit a dry, achenes convex on both sides, widest above middle, brown, 0.2-0.3 cm, constricted above, tubercle flattened, tip pointed, about half to a third as long as achene, June-Oct. Frequency in NYC: Rare (G4; NYS S1, E). Habitat: Shallow water along the coastal plain, often tidal soil pH 5.8-7.2 (USDA, NRCS 2010).